هاشمی, زهرا, هادوی, مریم, اسداللهی, زهرا. (1396). مقایسه راهبردهای یادگیری واژگان انگلیسی دانشجویان جدید الورود و دانشجویان سال آخر دانشگاه علوم پزشکی رفسنجان. 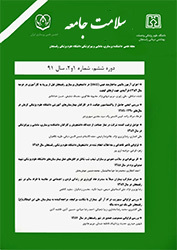 سلامت جامعه, 9(4), 81-89. زهرا هاشمی; مریم هادوی; زهرا اسداللهی. "مقایسه راهبردهای یادگیری واژگان انگلیسی دانشجویان جدید الورود و دانشجویان سال آخر دانشگاه علوم پزشکی رفسنجان". سلامت جامعه, 9, 4, 1396, 81-89. هاشمی, زهرا, هادوی, مریم, اسداللهی, زهرا. (1396). 'مقایسه راهبردهای یادگیری واژگان انگلیسی دانشجویان جدید الورود و دانشجویان سال آخر دانشگاه علوم پزشکی رفسنجان', سلامت جامعه, 9(4), pp. 81-89. هاشمی, زهرا, هادوی, مریم, اسداللهی, زهرا. مقایسه راهبردهای یادگیری واژگان انگلیسی دانشجویان جدید الورود و دانشجویان سال آخر دانشگاه علوم پزشکی رفسنجان. سلامت جامعه, 1396; 9(4): 81-89. مقدمه: راهبردهای یادگیری، رفتار و تکنیک­های خاصی هستند که زبان­آموزان آگاهانه بکار می­گیرند تا در یادگیری پیشرفت بیشتری داشته باشند. هدف از انجام این مطالعه مقایسه راهبردهای یادگیری واژگان انگلیسی دانشجویان سال اول و آخر دانشگاه علوم پزشکی رفسنجان بوده است. مواد و روش ­ها: در این مطالعه توصیفی، مقطعی کلیه دانشجویان سال آخر ورودی 1390 و همچنین دانشجویان ورودی جدید (1393) به روش سرشماری مورد بررسی قرار گرفتند. ابزار جمع‌آوری اطلاعات پرسشنامه گو و جانسون بود که 8 استراتژی یادگیری را بررسی می­کند. دانشجویان با انتخاب یکی از گزینه‌های " هرگز، بندرت، گاهی اوقات، معمولاً، همیشه" استراتژی‌های خود را در یادگیری زبان انگلیسی مشخص می­نمودند. اطلاعات با استفاده از آزمون‌های آماری توصیفی و تحلیلی (تست دقیق فیشر، آزمون ANOVA یک­طرفه، تی مستقل و مجذور کای) تجزیه و تحلیل شدند. نتایج: تعداد دانشجویان مورد بررسی 449 نفر بود که 5/52 درصد (236 نفر) از آنها را دانشجویان سال اول و 5/47 درصد (213 نفر) را دانشجویان سال اخر تشکیل می­دادند. استراتژی حفظ کردن، بیشتر از سایر استراتژی­ها برای یادگیری زبان مورد استفاده قرار می­گرفت. دانشجویان سال اول به طور معنی­داری از استراتژی­های اجتماعی، توجه خاص، نت برداری، حفظ کردن، حدس زدن و استفاده از دیکشنری را بیشتر از دانشجویان سال آخر استفاده می­کردند (05/0>p) .این اختلاف در مورد استراتژی­های استقلال و سبک یادگیری، معنی­دار نبود. نتیجه ­گیری: استفاده بیشتر اساتید دروس زبان انگلیسی دانشگاه از تکنولوژی­ها و فناوری­های جدید آموزشی حین تدریس، آشناسازی دانشجویان با راهبردهای مختلف یادگیری زبان انگلیسی و تشویق دانشجویان به استفاده از استراتژی­های مختلف، تأثیر بسزایی در تسهیل یادگیری این زبان خواهد داشت. Introduction: learning strategies are mindful beliefs and actions that learners apply in order to acheive learning objective. The aim of this study was to compare the vocabulary learning strategies among first and senior students at Rafsanjan University of Medical Sciences in 2011. Materials and methods: In this cross- sectional study all the first year and last year students in different fields of study were evaluated. The instrument utilized was a modified version of Gu and Johnson questionnaire which consisted of 45 items related to the students' approach to vocabulary learning. The participants were asked to answer each item with a 5-point Likert-style frequency scale as follows:) I never or almost never do this, 2) I don’t usually do this, 3) I sometimes do this, 4) I usually do this and 5) I always or almost always do this. The data were analyzed using Fisher’s exact test, one way Anova and independent T.
Results: Four hundred forthy nine students participated in this study. 52.5% (236) were freshmen (first year) and 47.5 percent (213) were seniors. The results indicated that memory strategy was used more than the other stratgies. First year university students used more vocabulary learning strategies including social, selective attention, taking notes and dictionary strategies compared to the last year students (p<0.05), and this difference was statiscally significant, but the difference in the use of autonomy and study style preferences was not significant. Conclusion: It is sensible to suggest that English language teachers reconsider their teaching styles and consider different techniques to promote vocabulary learning. Base on the results of this study it could be concluded that the use of new teaching thechnologies and familiarzing the students with the learning strategis could aid the ease of learning a second language for the medical sciences students. Chamot AU. Language learning strategy instruction: Current issues and research. Annual review of applied linguistics 2005;25:112-30. Hsiao TY, Oxford RL. Comparing theories of language learning strategies: A confirmatory factor analysis. The Modern Language Journal 2002;86(3):368-83. Oxford RL. Use of language learning strategies: A synthesis of studies with implications for strategy training. System 1989;17(2):235-47. Yılmaz C. The relationship between language learning strategies, gender, proficiency and self-efficacy beliefs: a study of ELT learners in Turkey. Procedia-Social and Behavioral Sciences 2010;2(2):682-7. Oxford R, Nyikos M. Variables affecting choice of language learning strategies by university student. The modern language journal. 1989; 73(3): 291-300. Winke PM. The psychology of the language learner: Individual differences in second language acquisition. Studies in Second Language Acquisition. 2007; 29(1): 143-4. Peirce BN. Social identity, investment, and language learning. TESOL quarterly. 1995; 29(1): 9-31. Lyster R, Ranta L. Corrective feedback and learner uptake. Studies in second language acquisition. 1997; 19(1): 37-66. Green JM, Oxford R. A closer look at learning strategies, L2 proficiency, and gender. TESOL quarterly. 1995; 29(3): 261-97. Wharton G. Language learning strategy use of bilingual foreign language learners in Singapore. Language learning 2000;50(2):203-43. Lee KR, Oxford R. Understanding EFL learners’ strategy use and strategy awareness. Asian EFL Journal 2008;10(1):7-32. Yang M-N. Language learning strategies for junior college students in Taiwan: Investigating ethnicity and proficiency. Asian EFL Journal 2007;9(2):35-57. Nemati A. Enhancing long-term retention by memory vocabulary learning strategies. The Journal of Asia TEFL2010;7(1):171-95. Attachoo B, Chaturongakul P. A Study of Vocabulary Size, Competency, Learning Strategies, and Perceptions of Problems with Vocabulary Learning of Students with Learning Disabilities. LEARN Journal: Language Education and Acquisition Research Network. 2015; 8(2): 59-83. Khatib M, Hassanzadeh M, Rezaei S. Vocabulary learning strategies of Iranian upper-intermediate EFL learners. International Education Studies 2011;4(2):144-52. Gu Y, Johnson RK. Vocabulary learning strategies and language learning outcomes. Language learning 1996;46(4):643-79. Seddigh F, Shokrpur N. Vocabulary learning strategies of medical students at Shiraz University of Medical Sciences. English Language Teaching 2012;5(2):160-73. Fan MY. Frequency of use, perceived usefulness, and actual usefulness of second language vocabulary strategies: A study of Hong Kong learners. Modern Language Journal 2003;87(2):222-41. Hinkel E. Handbook of research in second language teaching and learning. Routledge Publishers. 2011. Volume 2. ISBN 1136863958. Baxter J. The dictionary and vocabulary behavior: a single word or a handful? Tesol Quarterly 1980; 14(3):325-36.